UK publisher Ripstone has already worked with download game developers such as Nifflas to bring us Knytt Underground on Wii U, while Pure Chess is on the way to both Wii U and 3DS. 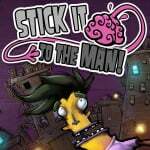 The publisher is continuing to target the home console's store, however, with confirmation today that Zoink's Stick It To The Man is coming to the Wii U eShop this Spring. This is a title that has certainly caught the eye on Steam and PSN before now, with its charming paper-based aesthetic and a comedic, wacky storyline. An adventure with point-and-click inspiration that also has elements of platforming and stealth, it aims to entertain as well as challenge — with its humorous art-style and the writing talent of Ryan North (who works on the Adventure Time comic) it may deliver just that. 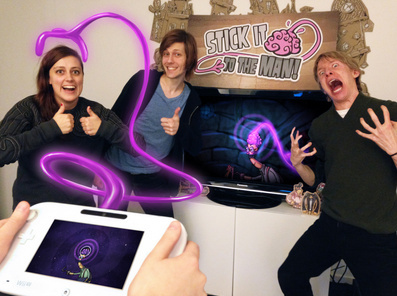 It's also confirmed that there'll be features unique to Wii U, with the mind-reading mechanic appearing through a separate view on the GamePad screen. Below is a launch trailer from last year to give you a taste of what the game will offer, and we'll publish an interview with both Ripstone and Zoink this coming weekend. Looks pretty good not as good as Broken Age though. It's a 2D Pyschonauts w/ some Costume Quest. Looks like Doublefine made it. Much better than Stacking. Great music too. I'm in. Wait, this is on PS? Really? Must be the weird title made me miss it, I and thought it was 1 of those stick-figure games. Is NL live streaming the ND today? Only 5 hours and no post for it? Does the Wii U eShop or web browser have live stream capabilities? My kids are home from school today - snow day again - and I'ld rather we watch it on the 52" screen than the 19" screen. Though in a pinch I suppose I could hook up the laptop. They never usually post the article with the live stream link until an hour or even 30 minutes before anyway. I read this one got decent reviews on PSN, so I would be picking it up. Looks great, will certainly good it if the reviews are okay. Great game. Played the PS3 version and couldn't put it down. Absolutely hilarious from start to finish. Looks like Paper Mario......to me atleast. I'll probably check this out, never heard of it until now and it looks pretty good. I didn't see that coming - I thought it was a Playstation exclusive. Sure, it's stylish, but I hadn't really had my eye on it on account of it being on the PS4. Phew! Nearly bought this on the ps3 last night! Will get it on WiiU instead now. This looks like a good buy! @ThomasBW84 - Thanks TW. Wow 102 comments already? That's what I get for eating lunch. dammit - just bought it on Vita. Didn't know it was coming to Wii U, which I would rather play it on. Only played about 45min of it, but its pretty great so far. Stopped reading at "writing talent of Ryan North." And decided that I'll be getting this game. His "choose your own adventure" Hamlet is a hilarious and fun read. This game looks like an equally good time. Looks like some strange fun. It's different. I like different. I'm in!